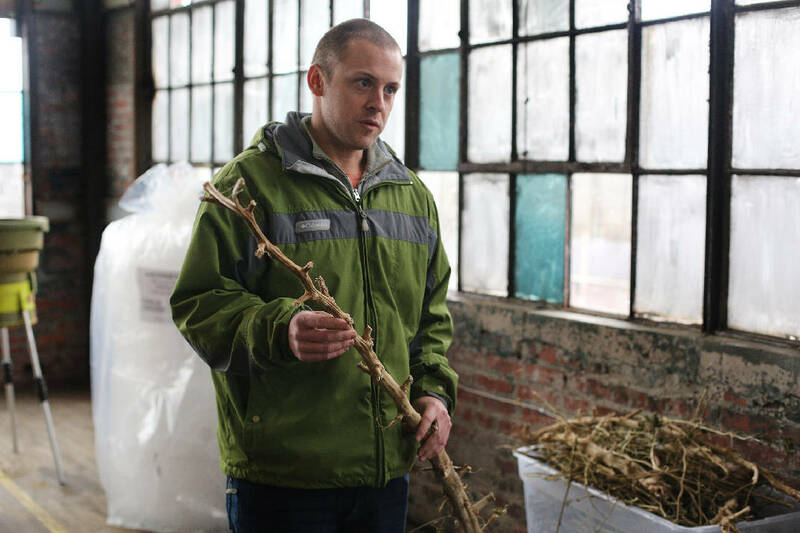 Travis Phillips, a co-founder of Little Tree Labs, talks about the hemp plant and shows a branch after the leafy and flowery portion has been removed at Little Tree Labs Wednesday, December 19, 2018 in Chattanooga, Tennessee. Phillips said he believes as the production of hemp increases, the branch portion will likely start being used in paper product production. Last year's tax season had just ended when certified public accountants Travis Phillips and Alan King sat down for lunch, reflecting on the year. They began discussing emerging industries, contemplating their passions and the future. Phillips, an avid gardener who likes hands-on projects, had been interested in the cannabis industry for a decade. He watched documentaries, read articles and studied the science behind the plant's medicinal properties. "Yes, it's a business opportunity, but it's something a little bit more," King said. "I think there is a huge market out there, and its therapeutic effects are very wide-ranging." As the men ate, they decided they wanted in. Meanwhile, behind the scenes, politicians and lobbyists were working on major federal legislation — the 2018 Farm Bill — that would give the duo the ability to fully promote their new venture. The bill's passage in late December decriminalized industrial hemp on a national level and set the stage for Chattanooga's budding hemp industry to blossom. Although cannabis is the same plant as marijuana, not all cannabis works as a mind-altering drug, and the plant has many uses beyond getting people "high." Industrial hemp is cannabis without psychoactive properties, containing less than 0.3 percent delta-9 tetrahydrocannabinol, or THC — the chemical, called a "cannabinoid," that makes marijuana intoxicating. Hemp contains many other cannabinoids — such as cannabidiol, or CBD — and terpenes that don't alter behavior but may impart therapeutic effects. It's also not addictive, according to the U.S. Food and Drug Administration. It was historically a cash crop used for fiber and grain, but production declined after World War II as cheaper alternatives disrupted the market. Then the Controlled Substance Act of 1970 defined plants with any THC — no matter how small the amount — as marijuana. The move outlawed all cannabis farming in the United States. But over the years, the view has shifted in favor of cannabis again. In 2012, liberal states such as Colorado and Washington began to legalize recreational marijuana. And elsewhere, including in some conservative southern states — Kentucky, North Carolina and Tennessee — interest in an industrial cannabis movement began to simmer. Senate Majority Leader Mitch McConnell, R-Ky., and other lawmakers touted hemp as a promising commodity and alternative for farmers struggling with declining demand for tobacco. By 2014, the Tennessee General Assembly had removed industrial hemp and its products from the definition of marijuana in the state's criminal code and started the Industrial Hemp Agricultural Pilot Program. The move opened a new hemp industry in Tennessee, and interested individuals could apply to grow the plant. But excitement over the state's first hemp growing season in 2015 quickly morphed into frustration. With minimal guidance or hemp-growing experience, planting started too late, seedlings were overtaken by weeds, and pests decimated nearly 660 acres of crop. Eric Walker, an extension specialist who researches hemp for the University of Tennessee, said compounding the struggle was that, unlike established crops, there aren't herbicides, pesticides or best practices for growing hemp. "We're still trying to figure out the fundamentals for hemp production, like how many plants per acre, what's the best fertilizer rate, what are its water needs, where does it grow best?" he said. Thankfully, the new Farm Bill will help answer some of those questions, he said. "The hardest part of my job is disseminating research-based production recommendations with little to no research funding," Walker said. "The great thing about the Farm Bill, from a research standpoint, is it opens up funding opportunities for universities and other folks." Most of the successful hemp produced in Tennessee to date is the result of trial and error. It took farmers several years to realize that hemp high in cannabinoids — which requires less acreage — grows better in the region than the traditional fiber and grain varieties — which are planted more like row crops. There is also a much stronger market for cannabinoids. "I've seen enough to know that we can grow good hemp in Tennessee, but it's going to take a lot of work," Walker said. "I just want everybody to go into it with their eyes wide open. It's risky, but anything in agriculture is risky." Even with adversity, interest in industrial hemp production in Tennessee is high, particularly in hemp-based CBD. There is evidence the compound may reduce seizures, and many people report success using CBD to curb anxiety, gastrointestinal issues and reduce inflammation, among other health benefits. King said a major benefit of the Farm Bill is that it will facilitate more research to better understand the effects of CBD and other cannabinoids. "There's no doubt in my mind that real people are getting real benefits out of this, but the science is lagging because of our government," he said. The number of licensed growers in the pilot program has increased each year — from 49 in 2015 to 226 in 2018, according to the Tennessee Department of Agriculture. Seven of those 226 licensed growers in 2018 were from Hamilton County. The number of Tennessee hemp processors also grew from 38 in 2017 to 80 in 2018. Currently, most of the hemp in Tennessee is used for the extraction of CBD, but some participants are finding other uses. Many backyard growers make hemp smoothies or baked goods for personal use, one entrepreneur created hemp-infused spirits at his brewery, and a graduate student project is looking to use the fiber in concrete. Without the controlled substance designation, growers will have more access to loan opportunities, federal farm programs and crop insurance to mitigate production risk. Businesses also will be free to advertise, transport and sell industrial hemp products anywhere in the country. "There's room for everybody in 2019," Walker said. While the Farm Bill opens many doors for hemp farmers, processors and retailers, states will continue administering their own hemp programs, and it's unclear whether or not every state will jump onboard. Tennessee growers still must be licensed with the state. A spokesperson for the Tennessee Department of Agriculture said the state doesn't anticipate any immediate, significant changes to its industrial hemp program. For 2019, the industrial hemp grower application period is open through Feb. 15. Still reeling from tax season, Phillips secured a grower's permit, dug holes in the yard, and soon found himself picking caterpillars off hemp plants by flashlight in the middle of the night. "That was what I thought I was going to be doing — just grow a few plants for fun, be a part of this state's research program," Phillips said, "but really at the start of the grow, it got me interested in all aspects of how to make these products." With no instruction manual or background in chemistry, Phillips poured hours into researching and piecing together information on how to turn raw hemp into CBD oil for consumption. He starts by removing the hemp flowers and leaves from their stalk and grinding up the plant. Then, Phillips puts the material into a container that resembles a giant tea bag and soaks it in ethanol before freezing the mixture at negative 50 degrees Celsius. Additional filtration steps remove any leftover plant material before the distillation process, which uses a combination of heat and vacuum to convert the ethanol into gas and leave behind crude hemp oil. Along with King and a third partner, Phillips now runs a full-time hemp processing operation called Little Tree Labs out of a warehouse in Alton Park, where they transform raw hemp material into tinctures of "full-spectrum hemp oil." Their product officially hit the market on Black Friday. "I feel like it's a once-in-a-lifetime opportunity, not only to get in on an industry that's kind of up and coming, but for me," Phillips said. "I love to grow it, I love to process it and make the products from it, then hear stories of how it helps people." Phillips chose the ethanol extraction method because "it's the safest, healthiest way to do the extraction that provides the most benefit to folks." The only potential downside, which some consider an upside, he said, is that it leaves behind trace amounts of THC. "It's possible that over time — if you're using it every day for maybe a six-month period, maybe more, maybe less, depending on who it is and their body composition — you can build up that THC in your system to where you can fail certain drug tests. But that being said, our product is non-psychoactive," Phillips said. All of their products are tested by the state before and after processing to confirm that THC content is below the 0.3 percent limit. The highly anticipated Farm Bill now allows them to operate like a "normal business" by removing hurdles and legal gray area, Phillips said. It also will help generate more raw hemp supply, which has been hard to come by. "We've been giving preference to Tennessee farmers, so far, but there's not as much Tennessee supply out there," he said. King said the hemp industry is working to overcome long-standing stereotypes associated with marijuana, especially in the Southeast. Even with the Farm Bill in effect, Facebook disabled the page for Little Tree Labs in January. Facebook later reopened the page after a Times Free Press inquiry. And despite all the obstacles, $534 million worth of CBD oil was sold in the U.S. last year, according to the cannabis analytics firm New Frontier Data. "There is still a stigma associated with it, but I think that's going to be quickly turning," King said. "It's exciting to see the market turning, and we're excited to be one of the first people in Chattanooga to start getting this off the ground."